This article is about the NPCs. For the class, see Conjurer (class). Conjurers are aggressive, spell-casting NPCs specializing in the school of Conjuration. They are always hostile to the player and will attack you on sight. They are not affiliated with the Mages Guild: they will be hostile even if you are a guild member, and can be killed without guild repercussions. Conjurers can be found in various forts, caves, and ayleid ruins, as summarized at Conjurer Dungeons. All Conjurers, including Conjurer Adepts, are Conjurers by class and are members of the Conjurer faction. Their faction membership ensures that they are allied with the Daedra and other creatures that typically inhabit conjurer dungeons. Most of the time when you encounter a Conjurer, the game only specifies that a randomly determined conjurer-type enemy will appear in that location. Such a conjurer-type enemy has a 50% chance of being an actual Conjurer and a 50% chance of being a leveled Daedra. Conjurer Adepts are the conjurer bosses. Ten dungeons contain a single Conjurer Adept, typically as the last enemy that you will encounter. One additional dungeon, Fort Rayles, contains two. Knights of the Nine adds one non-respawning male Conjurer who appears outside Fort Bulwark. Spell Tomes adds one non-respawning male Conjurer who always carries a leveled spell tome. He is initially located outside Fort Cedrian but then searches for you and attacks you, regardless of your location. The quality of the dagger is determined by the Weapons Leveled List; for staves see Generic Staves. Being spellcasters, Conjurers have a special "Conjurer Birthsign" which provides them with +50 Magicka. Depending on their race, they can therefore have +100 or +150 maximum Magicka. As with Necromancers, Silence spells or a silence-enchanted weapon can be useful to prevent them from casting spells at you. 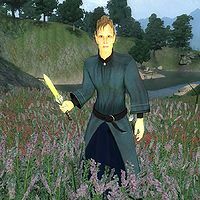 Conjurers' preferences are different from those of necromancers: they use blades rather than blunts and summon Daedra rather than undead. Also, conjurers do not carry scrolls. Martin himself will tell you that he was a conjurer in his youth.